TOKYO, Japan — With the UFO struggling for an identity, two of the world’s premiere mixed martial arts fighters stepped forward and showed promoters the way of the future. Rodrigo Nogueira and Jens Pulver, both considered the best fighters in the world in their respective weight divisions, put on inspiring performances that overshadowed the presence of pro wrestling. "TV executives are now clear… the no-rules fighting is more exciting than the pro wrestling," said a UFO insider who asked not to be identified. "In the next show, we will have more real fights and much less pro wrestling. No-rules fighting is the future in Japan." UFO was televised live on Nippon-TV and an estimated 7 million people watched the show… to go along with a live crowd of 20,000 at the Tokyo Dome. While the live crowd was smaller than hoped, the TV numbers were good enough for UFO to plan another show in January. In its debut, UFO mixed real NHB matches with pro wrestling bouts, thinking that it would take a big-name wrestler like Naoya Ogawa to get people to watch the show. While Ogawa is very popular, his bout against grossly overweight Matt Ghaffari was not a hit. Ogawa landed one punch to the nose of Ghaffari, who turned and ran away before quitting. In real matches, Nogueira, the heavyweight champion from Pride, dramatically ended his grappling chess match with Abu Dhabi champion Sanae Kikuta when he countered a low kick with a straight right that dropped the Japanese favorite and left him unconscious for several minutes. The end came at 2:29 of the second round. Pulver, the longtime UFC lightweight champion, made his Japan debut with a 15-minute standup war against K-1 competitor Takehiro Murahama. All rounds featured lots of punches landed, but Pulver pulled out a split decision, running his post-UFC record to 2-0. He was 6-0-1 in the UFC and is 29-2-1 overall. "I know I could have taken him down and probably won much easier on the ground," Pulver said. "But I prefer to stand up and fight and I was determined to come here and beat Murahama at his own game. From the way the fans reacted, I’d say they enjoyed the fight… and that’s important to me." 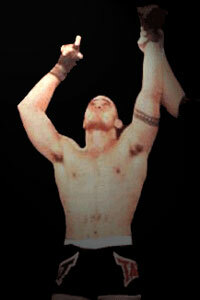 Pulver, a member of Team Extreme and Miletich Fighting Systems, said he has been asked to fight in the next UFO event. In other bouts, Vladimir Matyushenko overpowered and outwrestled Rogerio Nogueira (twin brother of Rodrigo) to win a unanimous decision. There was little standup in this bout, but Matyushenko landed enough strikes from the top position on the mat to win handily. Mario Sperry won a very low-energy bout against Wataru Sakata, claiming a unanimous decision. Sperry was severely cut above the left eye early in the bout and officials nearly stopped the fight. Afterwards, Sperry continued to get takedowns and maintain position on top. "They said if the cut opened up again, they would stop the fight… and I would lose or get a no-contest," Sperry said. "I got 10 stitches, so I did what I had to do to win the fight." Wallid Ismail, coming off a loss in Pride, stopped Murakami Kazunari with punches on the ground. A bloody Kazunari protested, but the TKO officially stopped the contest at 2:33 of the second round. In the night’s first bout, Hirotaka Yokoi made quick work of Canadian wrestler Bulldozer George, sinking in a rear choke at 47 seconds of the opening round. In a "suspect" bout, Pride standout Kazuyuki Fujita beat wrestler Tadao Yasuda by shoulder lock at 2:46 of the first round. The bout lacked any striking and seemed to support the rumors that it was a pro wrestling bout. In a bout labeled an "exhibition," former WWF wrestler Chyna (now Joannie Laurer) defeated last-minute replacement Chika Nakamura in 1:50 by referee stoppage. Nakamura was "recruited" from the crowd, where she just happened to be wearing fight gear. The next edition of the Storm Muay Thai event, promoted by the Chute Boxe team, is set to once again shake the city of Curitiba on August 24th. With the event fast approaching, the card is taking its final shape… Chute Boxe fighter & MECA veteran, Silvio Urutum, ended up out of Storm. His opponent jumped out of the event last week due to an injury, and with little time left before the 24th, Urutum will have to wait until the next show to be able to perform in front of the Chute Boxe home crowd. However, veteran Chute Boxe fighter with NHB experience, Osmar Dias Fernandes will be competing against Kleverson da Silva, who is a fighter from the BVT academy in Sao Paulo. Two other matches that promise to heat up the event are Paiva vs. Rafael, and Marlon vs. Peterson. Chute Boxes’s own Marlon Matias was considered one of the best athletes at the last Storm and is already preparing to do NHB in the near future. Speaking of NHB, Ruas Vale Tudo star Pedro Rizzo is already training hard for his upcoming fight in the UFC against Gan McGee. Rizzo told FCF he is training mostly with heavier opponents, due to McGee’s weight, and will fly to the USA two weeks before the event to finish his preparation with his master, Marco Ruas. Pedro will also have the help of K-1 legend Peter Aerts to help in his stand-up training for the fight. Aerts is coming to Brazil next week and will stay training with Rizzo until the date of his departure. On another small Ruas Vale Tudo note, Renato Babalu Sobral apparently signed a new contract with the UFC after his win over Elvis Sinosic in London, and is likely to be fighting at the UFC November show, although no opponent has been set at this point. The first ever fighting-only channel in Brazil, Premiere Combate, finally debuted this last Friday. The first day of broadcast focused on UFC 27, with Pedro Rizzo’s own commentary about the event and as well as discussion behind the scenes happenings. The most interesting part on the first day of broadcast was some interviews with fighters, footage of training sessions and Frank Mir teaching the infamous shoulder lock that he used to defeat Pete Williams. The first day of broadcast also featured some boxing matches. The channel costs approximately 10 dollars per month to be viewed. Rodrigo Minotauro Nogueira, his brother Rogerio and Mario Sperry arrived back in Brazil on Monday after their participation at the UFO event. While in Japan, fighting and training weren’t the only things they did. The "Zen Machine" and Minotauro also attended to the release party of a book showing a bit of the Brazilian Top Team members’ lives… from their training to surfing. A Japanese crew, who spent a good amount of time in Brazil following the day-by-day routine of the BTT stars and taking several pictures in the process, did the book. Sperry and Minotauro signed several autographs for a packed house during the release party, showing the importance of NHB fighters in Japan. As the Brazilian Top Team continues its conquest of Japan, the Deep event is the next stop on the "Top Team train." After three members fighting at UFO and Minotauro signing for Shockwave later this month, the next edition of Deep will also see the presence of three BTT members: MECA veteran Fabio Mello will be competing in Japan for the first time in his career, along with his teammate Gilson Ferreira. However the biggest surprise for Deep will be the appearance of Rogerio "Minotouro" Nogueira facing none other than UFC veteran Tsuyoshi Kohsaka! After his loss to rAw Team member Vladimir Matyushenko, Rogerio will be the third BTT member to grace the Deep ring in its next edition. Rodrigo "Minotauro" Nogueira is keeping his promise of fighting at both UFO and Shockwave! Nogueira was supposed to fight against K-1 fighter Mark Hunt, but Hunt supposedly only wanted to do the fight under full K-1 rules, and Minotauro felt he needed more time to prepare, so the PRIDE Heavyweight champion will wind up facing Bob Sapp, while Hunt got his K-1 rules fight against Don Frye. "Mino" is in Brazil now, but will be leaving again for Japan later this week to finish his preparation for his fight against the huge Sapp in the land of the rising sun. On the subject of the Chute Boxe team once again, Vanderlei Silva is still training hard in preparation for Shockwave, while negotiations are still going on. The negotiations for a fight with K-1’s Ray Sefo fell through about two weeks ago, and as of now another K-1 fighter, Cyril Abdil, will likely be Silva’s opponent at Shockwave. Since anything can change at any minute when PRIDE is involved, it’s tough to say exactly what’ll happen, but the fight will probably be signed this week since time is running out. The training sessions have been so hard that the "Axe Murderer" — who is known for never training with headgear — was sporting two black eyes last week, courtesy of Anderson Silva and Pele, and is now walking around with a very swollen nose. Reports have it that Vanderlei has been taking sparring very seriously and is probably in the best shape of his fighting career, being already around the 97kg, which will likely be the weight division for this next fight. After much talk and debate it seems that things are finally taking shape for the most important NHB even in Brazil nowadays, MECA World Vale Tudo. Promoter Rudimar Fedrigo told FCF that it has been now agreed with Sportv that MECA will have two more editions before the end of this year, and as of now the promoters are waiting for Sportv to define its schedule and set the date for the next one, which will likely be at the end of September or beginning of October. With fights like Eugenio Tadeu vs. Marcelo Giudice on hold, and the possible participation of Pele on the card, we can only hope things will be defined sooner rather than later! Los Angeles – August 12, 2002 – DreamStage Entertainment rocks the mixed-martial arts world with the latest additions to ShockWave, the largest PRIDE Fighting Championships event to date, taking place at the prominent Yoyogi National Stadium in Tokyo, Japan on August 28, 2002. At a press conference held in Tokyo on August 12, 2002, two official matches were announced. The first card addition, Antonio Rodrigo Nogueria vs. Bob Sapp, will be conducted under PRIDE FC rules. The second card addition pitting Don Frye vs. Mark Hunt will be conducted under K-1 rules. DreamStage added that prospective fighters who have expressed interest in participating in ShockWave are Wanderlei Silva, Semmy Schilt, Ernest Hoost and Mike Bernardo. 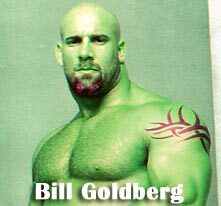 It has also been confirmed that former WCW superstar Bill Goldberg will be providing commentary for the PPV event, adding more excitement to an already thrilling event card. The two previously announced matches are the highly anticipated Royce Gracie vs. Hidehiko Yoshida and Kazushi Sakuraba vs. Mirko Cro Cop. It has been determined that strikes will be allowed in the Yoshida vs. Gracie bout. The rules for the Sakuraba vs. crop Cop match have yet to be determined. Additional card information will follow shortly. For the past two years, Ronald "The Machine Gun" Jhun, has been destroying competition throughout the world and occasionally in Hawaii… But not in the SuperBrawl ring. It is now confirmed that Jhun’s management and the SuperBrawl organization have come to terms on a multi-fight deal that will keep Jhun in the ring that began his illustrious career. "We could not be more excited to have ‘The Machine Gun’ back home." says T.Jay Thompson, SuperBrawl promoter. "Ronald began his career with us and we hope to now propel him to the international recognition he deserves." "The Machine Gun" will make his return on September 17, in the multi-national co-promotion "Super Brawl presents, The Universal Combat Challenge, Eruption in Paradise!" His opponent will be a Canadian UCC veteran to be named later this week. Expect bullets to fly on Tuesday night, Sept 17 at the Blaisdell Arena in Honolulu Hawaii! Super Brawl Signs 6 Super Stars to Multi-Fight Contracts! In a first for the SuperBrawl organization, 6 fighters sign exclusive multi-fight contracts. Ronald "The Machine Gun" Jhun, Cabbage, Falaniko Vitale, Baret Yoshida, Eddie "The Filipino Phenom" Yagin and Kolo Koka have all signed deals that will keep them exclusively in the Super Brawl ring for up to one year. "We could not be more pleased to give these talented athletes the security of a multiple fight contract. Although all these guys love to fight, money and contract negotiations are an issue. And now that is one less thing they will have to worry about." says SuperBrawl promoter T.Jay Thompson. The contract do, however, allow the pursuit of fights outside of Hawaii. "These fighters are now part of the Super Brawl family and we will take care of them as such. With our extensive contacts inside the MMA world, we will actively search for appropriate fights for these guys around the world. We have already secured a fight for Cabbage in the September UFC."